We’re very proud of what we’ve delivered in Wales. Superfast Cymru was an enormous engineering project with a complex set of challenges, but our engineers have risen to the task, delivering one of the outstanding digital network roll-outs in Europe. Approximately 733,000 premises across Wales can now access fast fibre broadband as a result of Superfast Cymru and our hard working engineers. 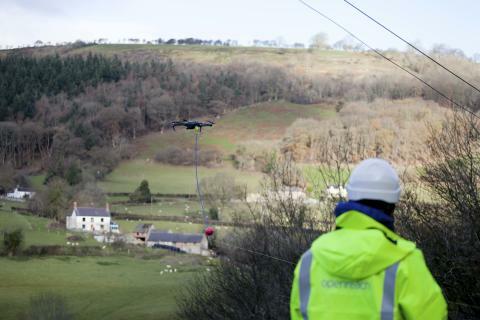 From using fishing rods to cast fibre over the River Conwy to flying drones over the Ceidiog Valley our engineers have come up with simple but brilliant solutions to complex engineering challenges that has successfully brought high speed broadband to our communities. The vast majority, 717,000, can access speeds of at least 30 Mbps while the remainder can access speeds of at least 24 Mbps. This is a significant achievement that we should all recognise. Building fast and reliable broadband infrastructure is another step towards Wales becoming a truly united and connected nation. Thanks to this project, homes and businesses in some of the most rural parts of Wales now have fast and reliable connections that will support all manner of data-hungry services and applications, such as telehealth, virtual and augmented reality and smart home devices, for decades into the future. Fibre broadband coverage has more than doubled as a result of our roll-out, and Wales now has the largest full fibre to the home footprint in Britain. We’re supporting the Welsh economy. Not only is our new digital infrastructure bringing a wealth of new growth opportunities to businesses across Wales, throughout our build we’ve remained committed to maintaining a Welsh supply chain. As a result of our work with Superfast Cymru we’ve created full time career opportunities for more than 120 apprentices and provided more than 80 new full time jobs. But it doesn’t stop there and we’re continuing to recruit in Wales. Only recently we announced that we were recruiting more than 250 new trainee engineer roles across every part of the country to expand, upgrade, maintain and install new services. We’re still building in Wales. Make no mistake Openreach is at the very forefront of building infrastructure that’s fit for the future. We’re already building the next generation of future proof digital infrastructure for Wales and the UK, and our ambition is to build faster, more reliable full fibre broadband technology to 3m front doors by 2020. Cardiff is among the first cities to benefit from our build programme, and that will make it one of the best connected cities in the world. We’ll also continue to extend our full fibre network into rural parts Wales. Wales can confidently claim to having better superfast broadband coverage than Germany, France and Italy but we’re also mindful that some communities are still waiting to gain access to better connections. We’re more determined than any other business to reach these remaining areas and we’ll continue to offer a solution through our Community Fibre Partnership programme. We’re also committed to exploring the alternatives with Welsh Government to make decent broadband a reality for all.